Download the Mach 3 User Guide! The SpinOlution Mach 3 is a top of the range production spinning wheel – everything you could want from a stylish modern spinning wheel. The Mach 3 wheel is a T-frame wheel like the SpinOlution Echo entry-level wheel but with the size, weight and performance of the SpinOlution Mach II wheel, plus some new features. The Mach 3 has three large 8 oz bobbins to hold all the yarn you want and sealed precision bearings for smooth operation. 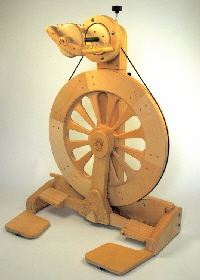 It has a true double treadle that can be used as a single treadle as well, to allow for personal preference in treadle use. The open orifice which allows for easy start up and easy spinning of novelty and other yarns, from heavy ply’s to lace weight. Easy bobbin removal with magnetic catches alleviates the hassle of disassembling spindle assemblies. 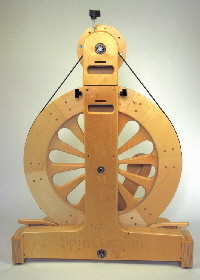 The bobbin is free to be removed with a simple grab and pull. The Mach 3 spinning wheel is made from furniture grade Birch Plywood, for years of dependable use and it has a stable base with rubber feet. The heavy construction and rubber feet keep the wheel in front of you while you spin, instead of across the room. SpinOlution spent years working with different materials to make sure the best ones were used for longevity and the proper mechanics and the Mach 3 has brass and stainless steel hardware for years of reliable use. The toe brakes stop the wheel quickly, safely and easily, from either foot. The adjustable tension allows you to set the drag to the right level for the material you are spinning and there are 5 speeds, with ratios of 1:3.5, 1:5, 1:7, 1:11, and 1:21, for all types of spinners and fibre. The SpinOlution Mach 3 spinning wheel requires a little assembly but this is quick to do. There are 4 pieces in the box, the main frame with drive wheel installed, the flyer assembly and the 2 feet. Four screws are provided and assembly comprises attaching each of the feet with screws followed by fitting the flyer assembly. This is followed by draping the drive band over one of the pulleys, inserting the band between the hub and treadle and guiding the band around the wheel. The whole procedure should take no more than 10-15 minutes and is very similar to assembly of the T-frame SpinOlution Echo spinning wheel. Material: Furniture grade Birch Plywood. And SpinOlution accessories including SpinOlution Lazy Kate, SpinOlution 3 Drop Spindle set with weights, Mach/Echo/Bee bobbins & drive bands, etc.